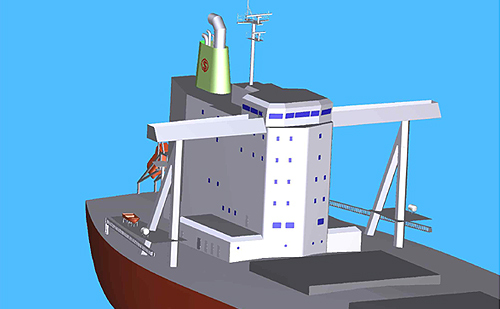 Imabari Shipbuilding has developed the Aero-Citadel, a newly designed superstructure which brings to realization both energy efficiency and anti-piracy measures. The Aero-Citadel is a superstructure with slimly streamlined shape which combines ship’s accommodation, engine room , and funnel casing. Wind pressure during navigation will be reduced by 25-30% (as the result of the wind tunnel testing). 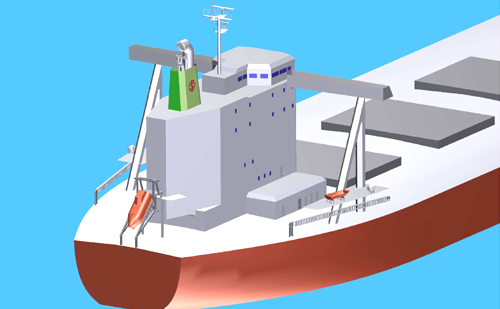 In case of Cape size bulk carrier, it will enable a decrease of about 2% in fuel consumption (at normal output, about 9m/sec. – Beaufort 5 head wind). New marine use LED lighting is also introduced to the accommodation and engine room lighting system, which reduces electric power consumption used for lighting by about 50%. The slim, streamlined shape makes it easy to turn the bow of the ship toward windward during anchorage, and decrease the risk of anchor dragging. All stairs are placed inside the superstructure as an anti-piracy measure, the entrance on lower level deck has thicker, reinforced steel doors. The accommodation windows are bulletproof, and water cannons are placed on the upper deck to prevent pirates entry into the accommodation. There is a citadel facility which is refuge area in the superstructure that can accommodate all crewmembers for several days, protected by double-layer security doors. The facility is also equipped with communication devices usable even in case of blackout, ship maneuvering equipments such as stop main engine and steering gear, and is able to gather information of the ship’s data, including video picture and sound. The accommodation design also includes features in accordance with the SOLAS, MLC 2006 requirements which will come into effect in near future, such as strengthened noise insulation and vibration counter measure. Improved living conditions for crewmembers are provided and the wheelhouse has widened backward view for safer navigation. Imabari Shipbuilding proposes the next generation superstructure Aero-Citadel to be applied for possible type of vessel, paying special attention to energy efficiency and environment issue, and pursuing reinforced anti-piracy , improvement of safety and living condition of crew members.